As part of my job, I occasionally blog for ShopPerk, an app created to help people shop smarter and live better. While the app is in development, the food blog is in full swing. Earlier this week, I wrote an ode to my Dad and “P” foods. In honor of Father’s Day, it’s reposted below. (And Dad, thank you for being such a good sport about seeing your private email conversation posted on a public blog. I learned my good-sportedness from you). My dad is really good at making pancakes. 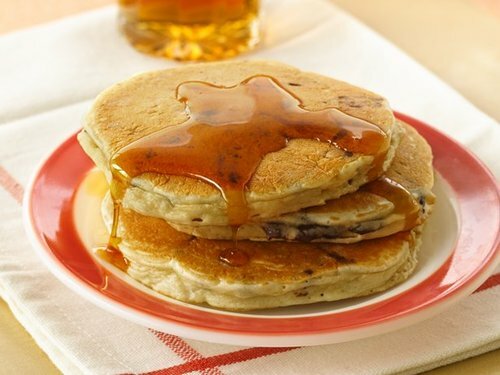 Pancakes with bananas, pancakes with blueberries, pancakes with chocolate chips—you get the picture. Actual picture from Betty Crocker. On the occasions when my mom was out of town, he would expand his repertoire and make my sisters and me other foods starting with “P.” We’d have pizza (pepperoni with green peppers for good measure) peas (of the frozen variety), popcorn (unbuttered but lightly salted) and pancakes for dinner instead of breakfast. Apart from the peas, we loved dad’s cooking. In preparation for this blog, I emailed him and asked him to remind me what other “P” foods he made us. Me (10:43 a.m.): Hey Dad, I’m writing a blog for ShopPerk about the different “P” foods you’d make for us when we were kids. Pancakes, pizza, popcorn… what am I missing? Dad (11:09 a.m.): Hi Ash. Pasta – as in macaroni and cheese (made in hot dog water). Later, I added Panera to my list. I will probably think of some others and will let you know. Have a great day! Dad (11:20 a.m.): Be sure to add peanut butter (and jelly). Occasionally a pop-tart made the menu as well. Me (12:19 p.m.): Thank you! Keep it coming. Dad (2:06 p.m.): Polish sausage. Me (2:37 p.m.): I don’t recall you ever making a pastry. Dad (5:27 p.m.): Didn’t I buy you a doughnut? Me (8:05 p.m.): Good point. Thanks! And that, my friends, is a good dad. To all you other dads out there, may you get really good at making foods that all start with the same letter. And may your kids love you even more for it.